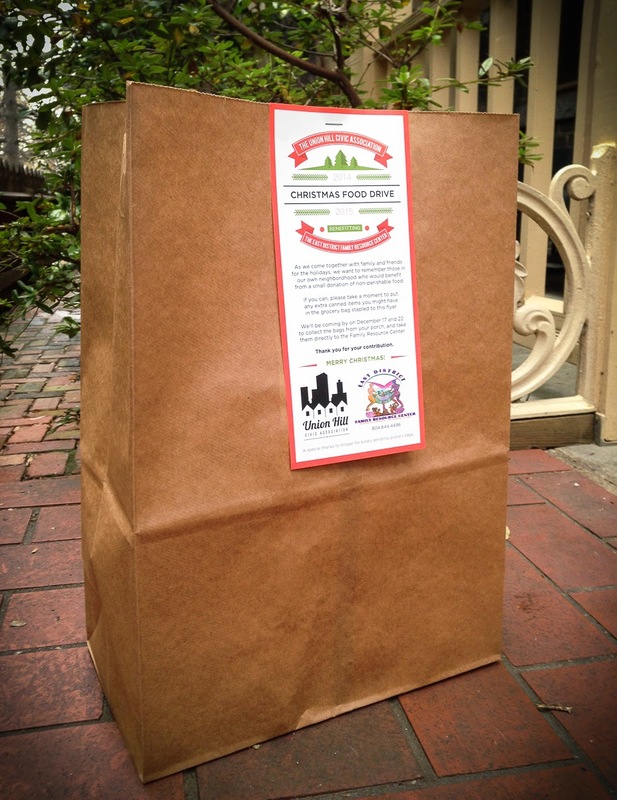 Your Union Hill neighbors placed these bags on front porches earlier this week. As we come together with family and friends for the holidays, we want to remember those in our neighborhood who might benefit from a donation of non-perishable food items. If you can, please take a moment to place canned food items in the bag that was placed on your front porch. Please leave the flyer attached to your bag and return it to your front porch either the morning of Wednesday, December 17 or Monday, December 22. Volunteers will be collecting bags on those days and will take them directly to the Family Resource Center on Jefferson Avenue. The food will be added to their food pantry, which directly benefits folks in the East End of Richmond. Special thanks to Kroger for providing the bags. Thank you for your contribution and Merry Christmas! Jefferson Park's Lonesome Pine is going to get decorated for the holidays this Saturday morning at 9:00. Hot chocolate and treats will await. Please feel free to bring any decorations you would like to donate to the cause. The tree is located near the performance stage. 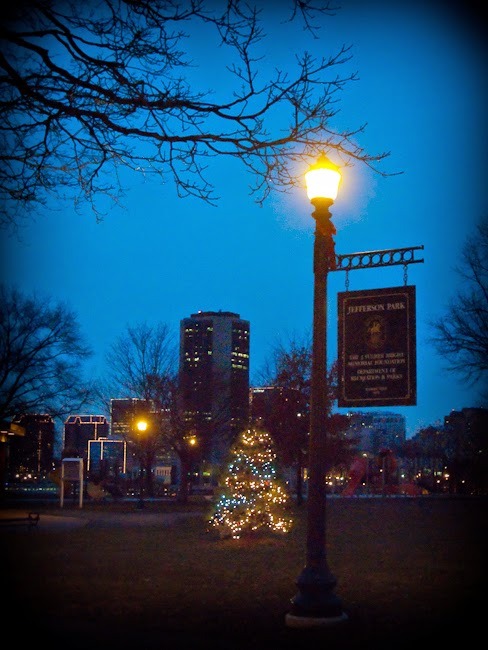 Later that evening the Union Hill Civic Association will be holding a tree illumination ceremony to kick off the Progressive Dessert tour. The festivities will begin at 6:30. This is an old picture--the tree is MUCH BIGGER now. Next members' meeting is Wed. Nov 19, 2014 @ 7pm. We've moved up the November & December meetings by one week due to the Thanksgiving and Christmas holidays. The November meeting will be Wednesday the 19th, the December meeting, Wednesday the 17th. Meetings will be held at the Family Resource Center, 2405 Jefferson Avenue, beginning at 7pm followed by social hour at the Union Market. To see the minutes from the most recent UHCA General Membership Meeting, click here. Thanks to Matt Conrad for taking notes and sharing the minutes. The Family Resource Center at 2405 Jefferson Ave is the location for out next UHCA meeting. Note the time change of 6:30pm. Following the organizational/business meeting join your neighbors at 7:45 the Union Market, 2306 Jefferson Avenue. Mark you calendar for Wednesday October 22 for the next UHCA general membership meeting. Time, 7pm. Location TBA. 6:30pm. Location is Family Resource Center at 2405 Jefferson Avenue. Agenda will be posted beforehand. In the meantime, if you have something to add to the agenda, contact our new president, Nikia Lemaire. 2. The first order of business was a report from RPD's First Precinct. Today's Richmond Times Dispatch has a story about what may be the future of Jefferson Avenue. Check it out by clicking here. 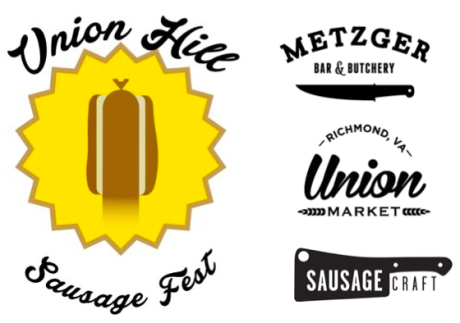 Come out on Saturday, September 20, 2014, for the Union Hill Sausage Fest, celebrating the unique heritage and history of Union Hill! From noon to sunset, enjoy SausageCraft sausage, Metzger Bar & Butchery and Union Market sponsored beer, and general revelry as we meet our neighbors and enjoy a good old fashioned block party. The event is also a fundraiser for Storefront For Community Design, an organization that helps low income neighbors renovate and fix their houses -- come find out more about Storefront! Recap from Organizational Meeting, August 27, 2014. At the 2014-2015 UHCA organizational meeting, Kenneth Samuels, Irvin Dallas, Nikia Lemaire and Marc Anderson volunteered to spend the next few weeks reviewing and revising the organizational By-Laws. They will be seeking input from members of the Association. Their recommendations will be presented at the next UHCA meeting on Sept. 24th. Marc Anderson agreed to serve as the new Vice President and Irvin Dallas will assume the role of Treasurer. Volunteers are still being sought for the positions of President and Secretary. Please attend our 2014-15 UHCA Organizational Meeting. Wednesday August 27, 2014, 7:00 pm, at the Family Resource Center, 2405 Jefferson Avenue. Followed by 8:00 pm social hour at The Union Market, 2306 Jefferson Avenue. The Consensus below has provided the framework within which UHCA has functioned for the last 12 months. It has been a very successful and productive year. And we have had a lot of fun!! However, it is important to review the organizational decisions we made last year and determine how best to move forward. Now is the time to share ideas and identify folks who are willing to help ensure the future of UHCA. Sausage Fest! Save the date: Saturday, Sept 20, 2014. 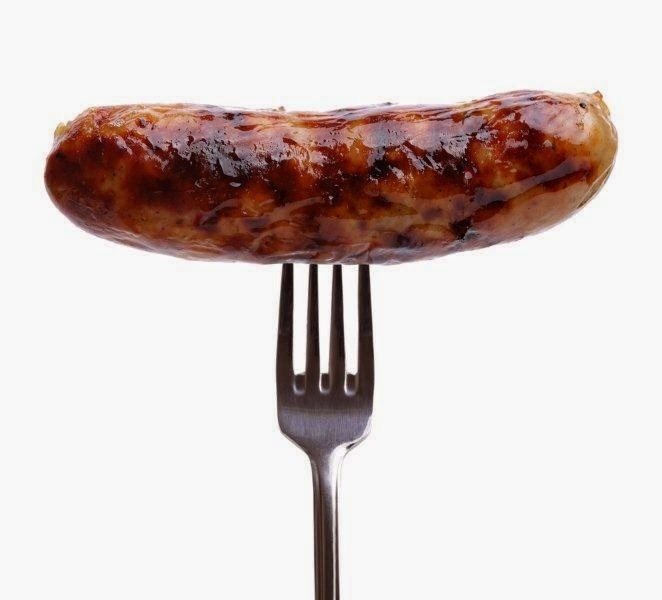 Save the date of Saturday, September 20, 2014, for the 2nd Annual Union Hill Sausage Fest! Location: N 23rd Street between the Union Market and Metzger's Bar and Butchery. More info to come. Check back here for details. Your input needed! Jefferson Ave "Pocket Park"
3HC, the Junior Board for the Better Housing Coalition, has selected the triangular plot of land on Jefferson Avenue (bounded by Jefferson Ave., E. Clay St., and N. 23rd St.) as the site for a pocket park design competition. What is a pocket park? And why did 3HC select this site? Come learn about this and more during our community meeting this Wednesday August 13th at 6:30 at Union Market (2306 Jefferson Ave.). Also, in the spirit of community-based design, we are seeking input on how the intersection of Jefferson Ave and 23rd st can be re-imagined as a better space for area residents. We will be soliciting your input during this meeting. If you're unable to attend Wednesday's meeting, please take a moment to follow the link below and fill out the 2 min survey. The survey results will elicit guidelines for the pocket park design competition. We have lots of great pictures from our annual UHCA Picnic on June 25, 2014. 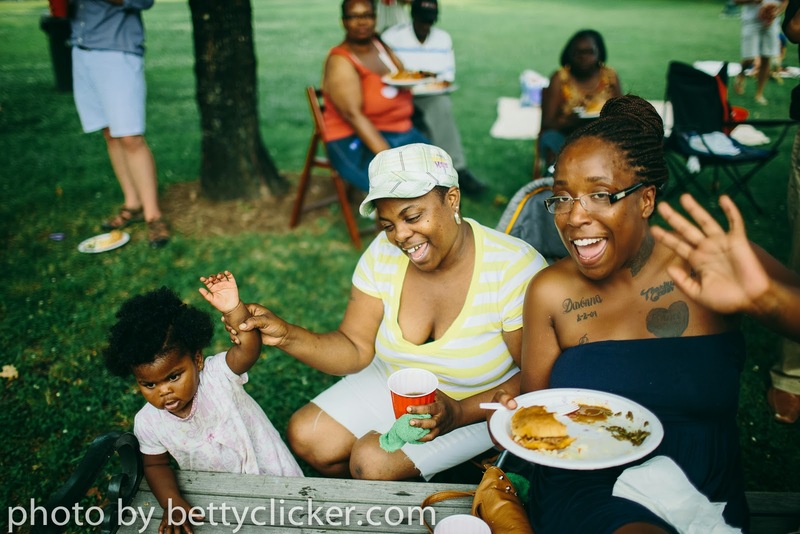 See the full gallery of picnic photos here. Big thanks to our neighbor, Kate Thompson of Betty Clicker Photography who recorded this wonderful evening. Thanks to the City of Richmond Public Art Commission and the artist Jack Witt for the unveiling and dedication of "Mr Smedley", our park's larger than life bronze sculpture of the whimsical street entertainer. Our thanks extend to the City of Richmond Department of Parks, Recreation and Community Facilities for cleaning the park house and getting the facilities in tip-top shape for the event. Last, but not least, thanks to the Friends of Jefferson Park for helping make the park look clean and green for the event, with many hours (and hands,) weeding and collecting litter. Our next neighbors meeting is July 23, 7pm at the Union Market, 2306 Jefferson Ave. It's open to all! The "meeting portion" of the gathering promises to be short; Lt Minton with a police update, several folks with local projects and plans to share and anything else you think needs to be discussed.The "social portion" promises to be friendly and fun. On Wednesday, August 27, 2014, the UHCA will hold a special meeting at the Family Resource Center, 2405 Jefferson Avenue, at 7:00 pm. The focus of that meeting will be to make decisions about how UHCA moves forward. It is hoped that you will make time for this very important meeting. So many good things have happened this year! Let's keep it going. Union Hill is home to a lot of vacant lots. Most of the lots are buildable for single family or multi-family homes and apartments. 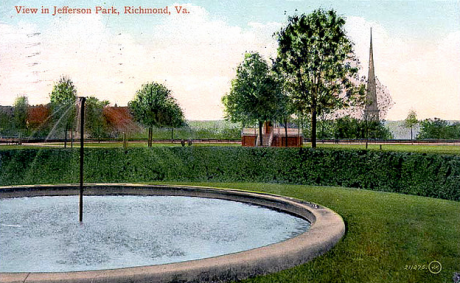 Union Hill is a City of Richmond Old & Historic District. Thus, plans for new homes must be approved by the Commission of Architectural Review (CAR) before a building permit is issued. The Commission of Architectural Review will meet at 6:30 p.m. on Tuesday, July 8, 2014, at the offices of Odell Architects, 2700 E. Cary Street, Richmond, Virginia. The Commission will be reviewing proposed changes to the Standards for New Construction in the Richmond Old and Historic Districts Handbook and Design Review Guidelines. Click here to see a copy of the proposed changes that the Commission will be considering at this work session. A current copy of the Guidelines is available on the City's website: http://www.richmondgov.com/CommissionArchitecturalReview/index.aspx . 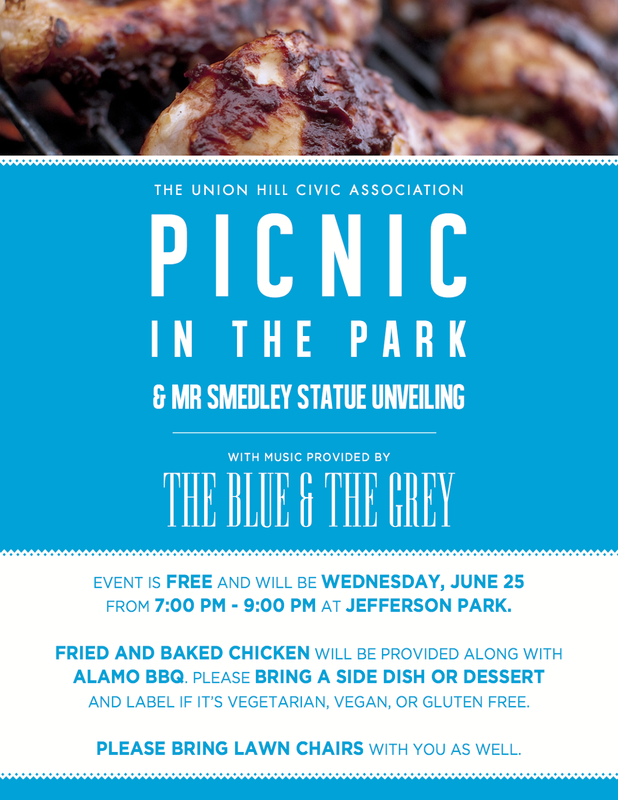 What an awesome good time we're gonna have on Wednesday June 25, as the the annual Union Hill Picnic returns to Jefferson Park! Bring a side dish or dessert to share. Label it vegetarian, vegan or gluten-free. We've got you covered with Alamo BBQ, fried and baked chicken, ice tea, lemonade and cold water. Bring your kids, your friends and your neighbors. Bring a lawn chair or blanket. This year, we'll celebrate the installation of "Mr Smedley" the bronze sculpture created by Virginia Artist (and VCU alumnus,) Jack Witt. Members of the Public Art Commission will join us for the festivities along with the artist and his family members. Live music from "The Blue & the Grey" will grace the park. We start at 7pm and wrap up by 9pm. See you there! Want to help with the Better Block event in Church Hill North on June 14th? Sports Backers needs volunteers for its walk/run 5k that morning, with shifts running from 8:30-10:30. Help run a water stop, be a course marshal, or work the start/finish and cheer on your neighbors as they enjoy some early morning exercise! For more information or to sign up, contact Mary Marshall Graeber at marymarshall@sportsbackers.org or 804-285-9495, ex 230. Lots to talk about at our next monthly meeting on Wednesday May 28. We'll meet at the Union Market at 7pm. 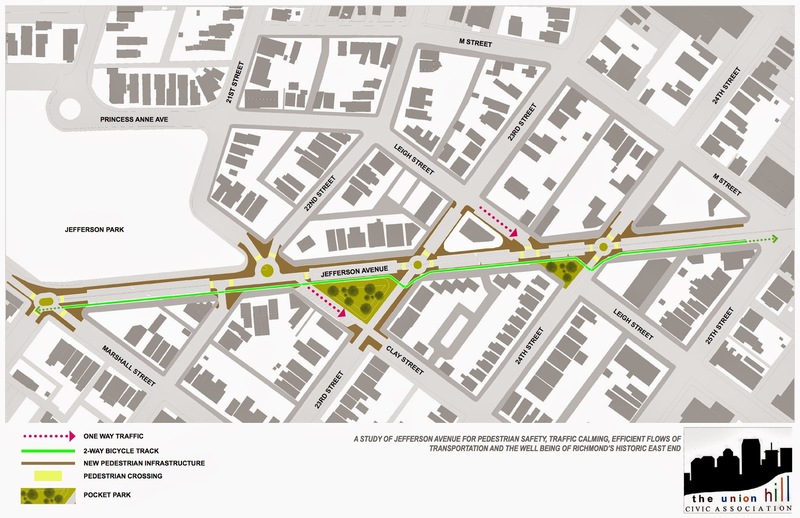 The agenda will include this proposal for transforming Jefferson Avenue into a more pedestrian and bike friendly corridor. The sketch is a starting point for neighbors and the city to create a master-plan for Jefferson Avenue. This preliminary plan was developed with input from people like you, who during the past three UHCA monthly meetings, shared their ideas for improvements. You can download a PDF of this proposed plan by clicking here. We are expecting representatives from the City's Traffic Engineering Department to attend our meeting. So please come with your ideas and support for creating a neighborhood-friendly avenue that will be safer for cars, pedestrians and cyclists to use, together. The goal is to encourage the ongoing commercial development of Jefferson Avenue, while creating more green space and a safer environment for everyone. Monthly meeting Wednesday May 28, 2014. Our monthly Union Hill neighbors, friends, members meeting is Wednesday May 28, 2014. We gather at the Union Market on Jefferson Avenue, so if you want to nosh, have a cold beverage or even eat dinner before, during or after the meeting, please feel free. Send any agenda suggestions to Mary Field <fieldmn@gmail.com>. Our monthly neighbors-meet up is this week: Wednesday April 23, 7pm, at the Union Market, 2306 Jefferson Avenue. We do a little bit of business, focusing on positive change in the neighborhood, followed by friendly socializing with a healthy dose of eating and drinking. We keep the agenda brief--using the social time afterwards to discuss things in as much detail as you like with friends and neighbors. If you have something to add to the agenda, please contact Mary Field at fieldmn@gmail.com. Annual Neighborhood Picnic in Jefferson Park We're planning the UHCA annual community picnic (date, TBA). The next Friends of Jefferson Park meeting will be on Tuesday, April 22 at 6 PM at 801 North 24th Street. All friends are welcome and encouraged to attend. Light snacks and refreshments will be served. Contact Mark Lemaire at 804-322-3016 or email@mark-lemaire.com for more information. What: Blue Sky Fund invites you to the ninth annual Church Hill Games! CHG is a sports clinic day in the Church Hill neighborhood that provides sports instruction, lunch, and an encouraging, faith-filled message to over 200 youth - ages K thru 8th grade. Over 100 volunteers are needed to make this event a success. Volunteers must be in 9th grade or older; children of volunteers in grades K-8th are welcome to participate in CHG but may not volunteer…yet! Come to the Union Market for our next neighborhood gathering and hang out with your neighbors Wednesday March 26 at 7pm. Bring your good vibes and have a drink and something to eat if you like. We typically speed thru our agenda, leaving lots of time to talk informally in small groups and socialize. 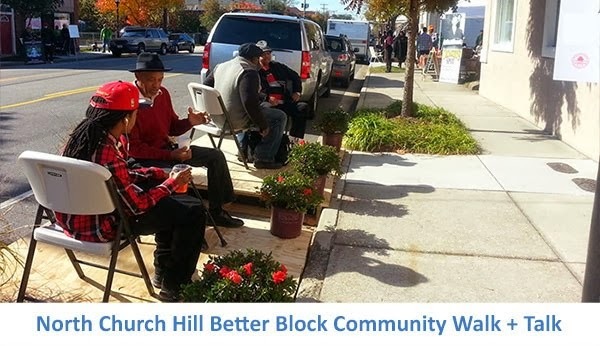 Richmond’s first Better Block project is coming to North Church Hill on June 13-14, 2014. The Better Block project is designed to temporarily transform a city block into a walkable, bikeable, vibrant place for people to gather, shop, eat, and socialize. In this case, the project will focus on a two-block stretch of N. 25th St. between P Street and R Street. Our next gathering will be at the Union Market (Jefferson Ave btwn 23rd & E. Leigh Streets,) Wednesday March 26 at 7pm. Please let Mary Field (fieldmn@gmail.com) know if you have something you'd like to add to the agenda. Snow dog day in Jefferson Park. The UHCA is having its first "unscheduled, irregular" meeting of 2014, on Wednesday January 22nd, at 7:00pm, at the new Union Market. 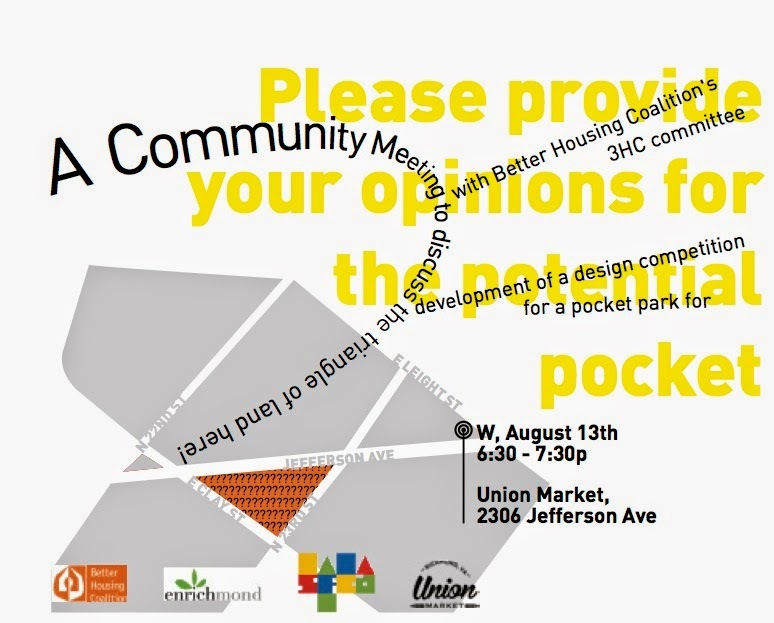 Everyone who cares about Union Hill (and wants to hang out with their neighbors,) is invited to attend. This will be, we hope, the first of many such informal opportunities for us to get to know each other and enhance the already awesome sense of community that makes our neighborhood so special. Bring you friends and join us for FREE coffee, tea and sandwiches January 22, 2014 at 7:00 pm. The Union Market is located at 2300 Jefferson Avenue. Click here to learn more about the Union Market.